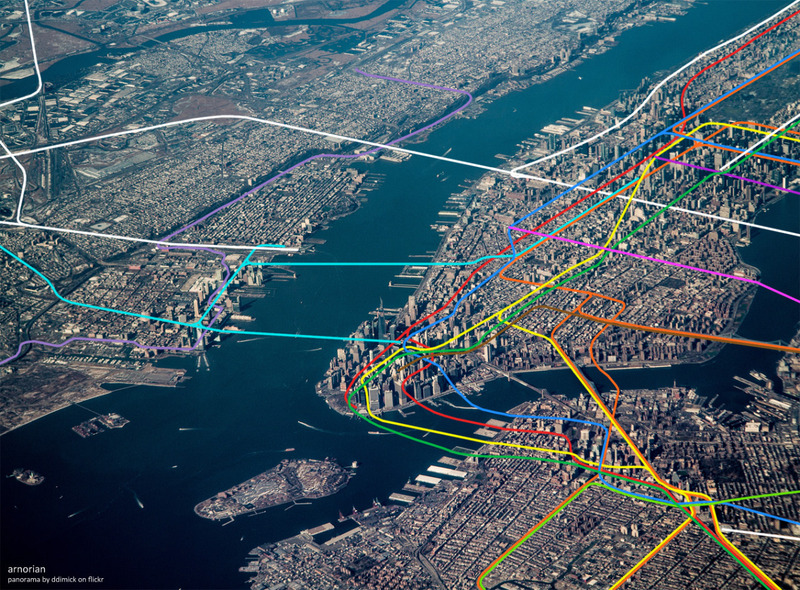 Behold an aerial view of the complex and far-reaching NYC subway system. When thinking about metro systems, we’re usually stuck visualizing either our regular commute or the standard subway map with all the stations labeled. However, here we have a "transit map" that allows a holistic understanding of the New York City subway system and its geographic context. Aerial photograph courtesy of Dennis Dimick/Flickr. This map was created by a self-professed metro system geek who goes by the name "Arnorian" online. After Arnorian came across the expansive aerial photograph taken by Dennis Dimick, he got the idea to superimpose the New York Subway, PATH, and NJ Transit Lines right on the photo. Arnorian wrote via email that tracing the exact position for the metro lines was relatively easy due to the regular pattern of the street grid -- with the exception of Downtown Manhattan, which was the area most difficult to map. Arnorian lives in Serbia and has never been to New York, but the map he’s created should prove fascinating for the New Yorkers who commute on these colorful lines every day.